I've been contacted by Dr. Jaeyoung Park of EMC2. He expresses his appreciation for the Talk-Polywell community. As a token of appreciation, and considering that they no longer work for the Navy and thus no longer have to keep mum, he is inviting the community to come up with a "Top 10 Questions" list for him, and he will provide answers! Here's how it will work. We'll take the next week, through the weekend, to discuss what might be good questions to ask. Propose and discuss your questions here. If we have more than 10 good candidate questions towards the end of the week, we'll take an informal vote and try to reach consensus over the weekend. I'll send Dr. Park our list on Monday, and post his replies when I get them. So! What do you think, everyone? Here's your chance. What are the most important questions you would like to know the answers to with regard to polywell fusion? What is the target $30M machine, and why not just put the required hardware on WB-8 instead of a new machine. Can results be obtained quicker than 3 years if expediting funds are obtained? Thanks Joe! This is great! And thanks to Dr Park for the opportunity to ask him questions. This is very exciting! I hear target fuel for the first reactor is D+T. Is that to play it safe? What are the prospects for D+D, Tritium catalyzed D+D or even He3 catalyzed D+D (with Tritium or He3 bred from fusing D+D). What scaling laws do you expect (if it is not too early to ask that)? Why did the Navy end its involvement? I am sure, I will be able to think of more until Monday. Somebody needs to figure out how to contact Art Carlson! Focus fusion is using Indiegogo as a scientific platform. Have you considered starting a polywell indiegogo for funding? How does Lockheed Martins fusion project stack up to the Polywell fusor, in so far as available information allows for comparison? What is Fusion One http://www.fusionone.co/ ? Will the $30 M Polywell research be done by Fusion One or is it unrelated to EMC2? Fusion one is a company started in Nov 2014 by Randal Volberg (the former CEO of a lithium enhanced water company) in Vancouver. I would have written them off completely, but they managed to snag Dr. Paul Sieck (EMC2 former head plasma physicist) and Dr. Scott Cornish (who developed polywells at the University of Sydney, the strongest University research so far). 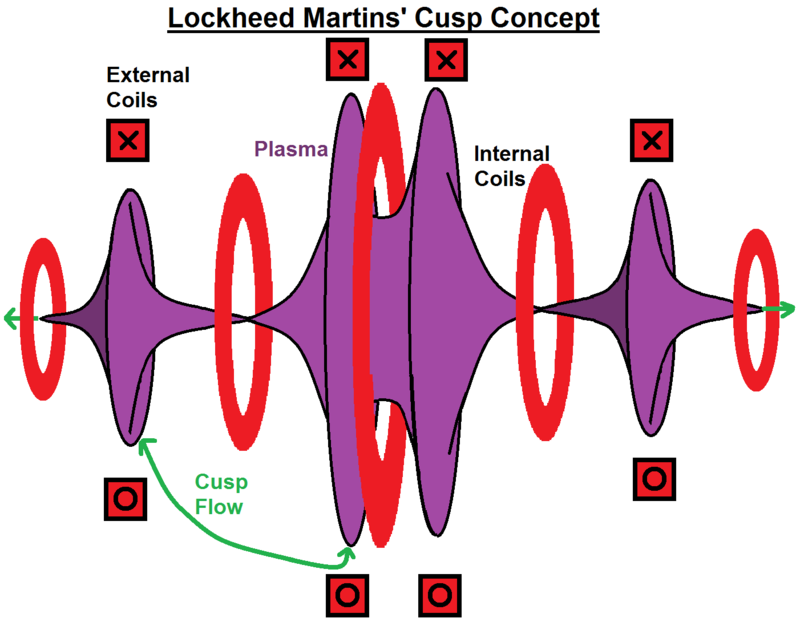 The Lockheed Martin approach heats plasma differently, but it is chasing the same method of plasma trapping as the polywell. The heating is done with neutral beam injection, whereas the polywell uses an electric field to heat ions to fusion conditions. Trapping (ideally) is done using the plasmas' own, intrinsic magnetic properties (its diamagnetism) to reject the outside field. Harold Grad and others, worked it out that if this happens - the plasma forms two regions: a high pressure zone of no magnetic field in the center, and a high field region around the outside with no plasma. This is spelled out in the proposed polywell trapping mechanism. This "cusp confinement" or "whiffle ball" effect is supposed to be favored in highly bent magnetic geometries. Several concepts have been proposed and/or partially developed to try and capitalize on this effect. These included toramacs, the picket fence concept, Lockheeds compact fusion reactor, polywells and (to some extent) magnetic mirrors. Thomas Dolans' early nineties review paper is where you can get lots of information about these concepts. I have not finished digesting it. It talks allot about "sheaths" and "holes" in these systems. The holes, are gaps in the surface. Dolan's review has several different approximations of hole size. The plasma sheath is like the "skin" around this high pressure plasma - along its' surface, the plasma pressure and the outside magnetic field pressure, balance. The Beta is one. Joel Rogers has talked about a "current" flowing along this sheath (but his work is not peer reviewed, and is based solely on his own simulations). I think this could be the worlds best method for trapping any plasma - if it works. Realize, all of the work before EMC2 paper only talks about these concepts, in theory. The EMC2 paper is the first and only experimental evidence of this effect. So we need to be careful when we discuss this topic. Last edited by mattman on Wed Feb 03, 2016 7:06 pm, edited 6 times in total. mattman wrote: [size=150]Fusion one is a company started in Nov 2014 by Randal Volberg (the former CEO of a lithium enhanced water company) in Vancouver. I would have written them off completely, but they managed to snag Dr. Paul Sieck (EMC2 former head plasma physicist) and Dr. Scott Cornish (who developed polywells at the University of Sydney, the strongest University research so far). That being the case, I suggest we focus our questions on EMC2, and skip asking about other companies (except perhaps in very general terms). ladajo wrote: Somebody needs to figure out how to contact Art Carlson! He's currently a Staff Scientist at the Max Planck Institute for Biochemistry. I haven't tried to message him, as I am not sure if the email tied to messaging is still monitored by him. Another ghost from the past to find would be Chris Bradley in England. I am sure either of them would be able to frame a good question. For my take: What is the primary mechanism impacting electron injection efficiency, and how does this scale in projections to a viable machine? Anyone want to give it a shot to bring Art back into the mix? 1. 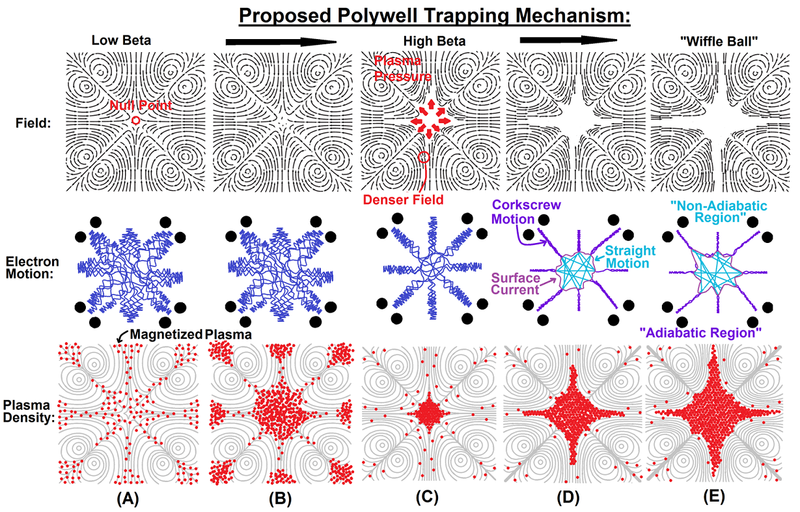 What are the prospects for operating Polywell in a steady-state vs. a pulsed mode? 2. Does the use of p-11B make steady-state operation easier or harder? 3. 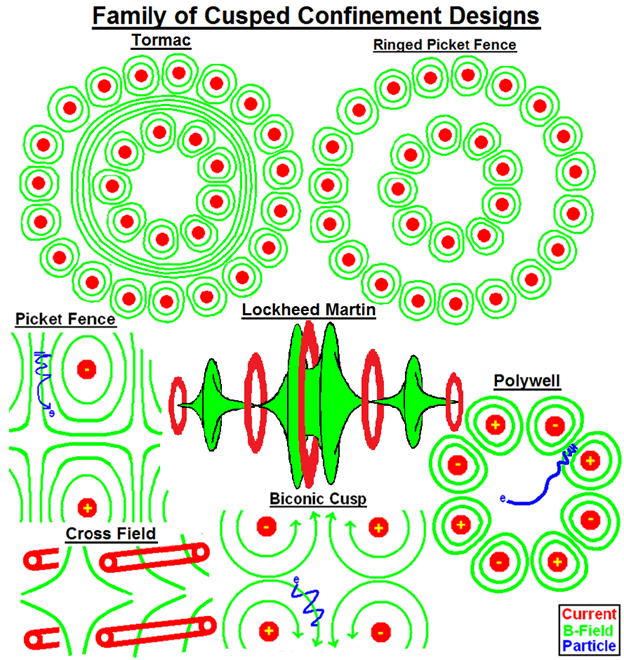 The Lockheed patent suggests that they are exploring dynamic compression effects by cyclically varying fields. Would "dynamic compression" (including perhaps LANL's POPS) be worth investigating for Polywell? 4. What is your best guess for the acheivable, time-averaged, usable power density for p-11B over time spans of, say, 10 minutes (ascent time to LEO)? 5. With p-11B, do you expect any significant gamma emissions? The Next Big Future article says you "estimate that a $30 million/ 3 year EMC2 effort could remove the remaining scientific concerns of successfully developing commercial fusion power technology." What are your remaining scientific concerns and which one concerns you the most? Why?